With the launch of Shadow of Revan, BioWare’s making major changes to the way you’ll develop your Star Wars: The Old Republic character. The short of it is: skill trees are out, disciplines are in. As described in a developer’s blog, skill trees are a slightly more fixed way of gaining your advanced class’s skills. You’ll gain them automatically as you level, and will gain key skills earlier, but you’ll also be able to spend some points on utility skills, so every character doesn’t play exactly the same. As the post explains, even with the greater flexibility of skill trees, there were only a few viable builds, so BioWare decided to do away with the unnecessary complexity. Design time spend re-balancing skill trees when there was a level update was also a factor behind the change. It’s probably a good move, but there will undoubtedly be some grumbling from folks who complain that all the flexibility of the system is being taken away — even when they’ve been using the same build that they copied off the Internet a year ago. What do you think of the change? Having played SWTOR to cap (55 at that time) and also looking at RIFT’s system..this looks oddly similar. SWTOR is already ridiculously simple as far as MMOs go so I guess character development had to be dumbed down too.. I do not play SWTOR, but customization is very important for me. 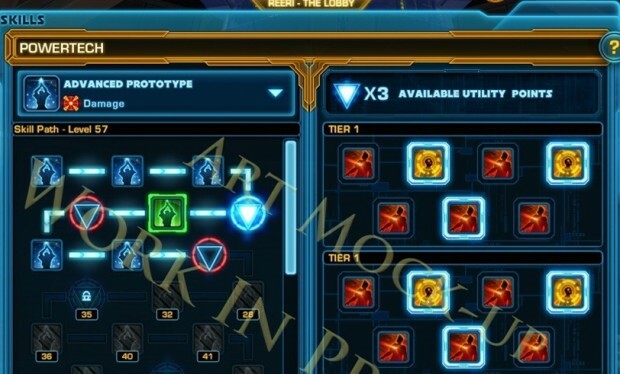 If i would be a SWTOR player i would not like this change at all.